Are you a business card apologists? Do you hand over your business card with trepidation as you got it from an email offer but were less then dazzled when it arrived? I’ve seen it many times while networking, someone handing over their card and shrugging with an apologetic look on their face, is this the face you want to pull with potential customers? One thing i find with new businesses is that they overlook the brand of their business at the start, which is understandable if you’re setting up on a shoestring and it’s more important to invest in the things that can make you do your core business to the best of your ability. This in itself is no bad thing, but what if you look like several other businesses when you’re presenting yourself, this is one thing that i have seen on a number of occasions, how do you stand out from those other businesses? 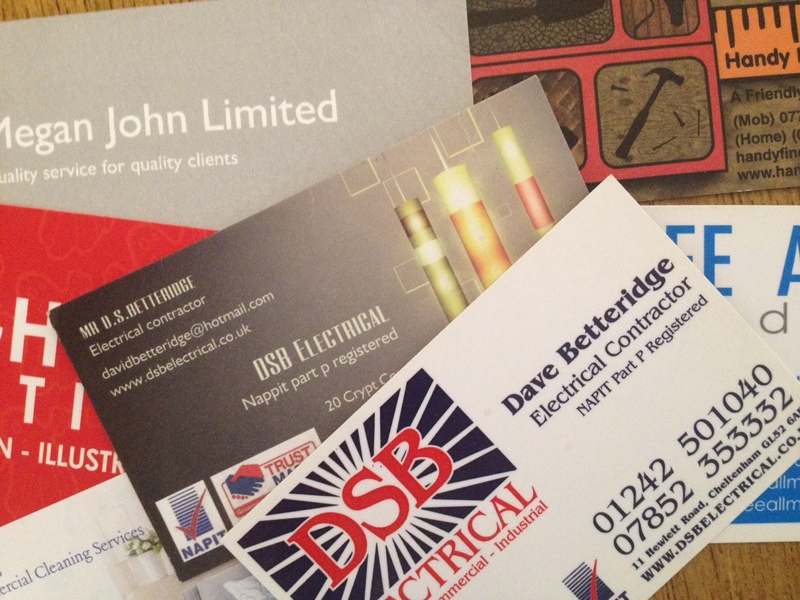 One way to stand out is with a good quality business card, not a flimsy card and certainly not with an advert for the company who did them on the back. I have had people say that it’s too expensive to get a good quality card, but is it really? if you were to go for a comparable quality of card from one of the many online producers with ‘free’ offers are you getting a good deal? In my experience, and I’ve sent quite a few business card to print in my time, you get something comparable to going through a designer if you choose your options wisely, but it does rely on you having your artwork ready to go and knowing what you want (which if you’ve not had experience of it before, you night not know what to expect). Where a designer will help is in advising what the best option for you is, they will show you samples of previous work, so you know what to expect, they will also make sure that what is going to print is suitable and if they are handling the print for you they will be able to sort out any problems on your behalf (i once had a job go back 6 times and had a personal call from the MD apologizing and promising to get it sorted). Yes, you’ll also have the costs of the designer, but what you’ll be paying for is their expertise, their experience and for them to make you stand out from the crowd. So, don’t be a business card apologist, get a card that you’re proud to hand out that truly reflects your business. (N.B. there is a place for those flimsy cards, a local business entrepreneur has them for a charity he is part of, totally unapologetic when handing them over, for him the cost was an important part, because it was a charity and it was less of an overhead, which is hard to argue with). Attending the Gloucester Business Show today, there was a great buzz in the room and for me, lots of faces that i knew and some that i didn’t, only to realize that we had conversed via social media but never actually met. There were some great exhibition displays (some of which i had a hand in and it was nice to see them in the flesh rather then on screen) and others that were more straight forward. so what does it take to to make an effective display for an exhibition? Are you just going to lay out your stand and hope that people pick up your collateral, take it away and ingest it’s content later or are you going to engage with those delegates and find those that really do have a need for your product or services? We’ve all seen stands that offer to win a bottle of champagne by dropping your business card in a big goldfish bowl, but this kind of data collection is hit and miss and tends to yield a low hit rate and, to be honest, if there’s a chance of free champagne, I’ll drop my business card in there regardless of my interest in the product, wouldn’t you? The key to engagement is to have people manning your stand that are knowledgeable about your business and can connect with those delegates that have a serious potential need in what you do. Hired hands are good and if well briefed can certainly grab those with interest in you and sell your services, but there is nothing quite like those on the front line, your staff, those with the intricate knowledge of your business, how it runs and what it does for your clients. Don’t be dissuaded if you’re a sole trader, that’s great, because you know what it takes to keep your business running and the passion you have behind it. But how do you engage? While some are erudite public speakers and able to hold a individual or crowed, enthralled with their vibrant linguistic display, if we are honest, most of us aren’t quite up to that standard. Most people who network regularly will have a pretty polished ‘elevator pitch’, beyond this takes a little bit more work, so how do you break the ice with those delegates and generate the right connections? There are several way, you could just catch people as they go by and try and entice them in to learn more about you, which, because we’re British, the majority of us don’t do this sort of thing, we just stand their with a handful of leaflets trying to palm them on to anyone waking past. You can lure those with more then a fleeting interest in with the promise or a FREE giveaway of a branded USB drive or branded stress ball (in exchange for a small amount of data collection if they would just like to fill out this post card, thank you). What you are doing is giving someone a premium promotional product that they will either use on a regular basis, or it will sit their, pride of place, on their desk, showing them your logo, 5 days a week, so that when they need whatever it is that you do, hopefully you’re the first name that comes to mind to get in touch with. What they are giving you is a little bit of engagement while they fill out the back of the postcard data form, which is the ideal time to find out more about their business and sell yours, you have them for the time it takes to fill out that form to handing over their promotional items that they want so much. But how is this different from just using the goldfish bowl to collect business cards I hear you cry? Well, they either just want to collect as much free stuff as possible at these kind of events, regardless of what it is, or by agreeing to take a little time in filling out their data they have a interest or need in what it is you do. The goldfish bowl is a bit like trying to catch a black cat. At night. Wearing a blindfold. You might do it, but the conversion rate is going to be low, on the other hand, by offering something a little bit better, for their information and a bit of engagement, you’ve a better chance of converting those to positive leads and business after the show by following up. They’ll remember you, hopefully be using your giveaway and be more receptive to finding out more about your services, a bit like removing the blindfold and giving you a torch. But the key to any of this is engagement, i see people walking past stands and exchanging hellos with the person on the stand (i’m guilty of this) and the exhibitor responding in kind but not making use of this as an in road. I’m reminded about an old boss of mine who worked at the height of the insurance sales boom in the early 90’s, that time when you could walk out of a telesales job in the afternoon and be in a new one the next day (fortunately for me i was still in education at the time). A time of open plan offices, wall street boom and Gordon Gecko as a poster boy, people made sales call from under their desk and bells were rung when targets were met (actually, this kind if thing probably still goes on). One thing that stuck though was his engagement and sussing out people on the phone, to the point that if he knew that it was going nowhere he would close down the conversation, thank them for their £20 and hang up. It didn’t cost them any money, but in his head he explained that that was how he based his calls, aiming for a conversion rate of 1 in 5 and that every time he made a sale it was £100 commission for him, so there was no point in keeping people on the phone trying to convince them when it was a dead end, it was best to move on and engage with the next person. I’m not saying that you should as ruthless as that, but don’t let that opening opportunity go to waste, you could be just what they are looking for, they just don’t know it yet. Regardless of how you lure delegates to your stand, the key is conversation, find out about their business, see if what you do might be beneficial to them, if not, politeness cost nothing and you can you can move onto the next person that makes eye contact and says hello. A while back i appeared on Radio Horton’s ‘Knowing your business’ show talking about graphic design and such stuff. Presenter Ian Gentles thought that the story behind the company name was quite a good one and a powerful motivator for pushing us forward. He’s edited the clip out for you to listen to, so, if you were wondering ‘Why Red Ghost’? have a listen to find out. If you would to force yourself to listen to my entire spot on the radio then check out my previous blog post ‘radio gaga’. I’m currently sitting looking through lots of paper samples, different weights, colours, textures and finishes and thinking of ways they could be used. One often over looked part of the design and print process is often the paper, which can have a big influence on how the final product looks and feels in the clients hands. Yes there are usually cost considerations from people and choosing the right paper can be a bit more expensive, but for the right project it can make all the difference if you can push that budget envelope just a little bit more. Don’t misunderstand me, there’s nothing wrong with using standard stock paper, but sometimes a project necessitates that it needs something special. While great design is able to make your company sing to their clients, the right choice of paper and finish can make it dance in their hands. The other week I found myself appearing on Horton Radio on the show ‘Knowing Your Business’. This all come about via a Facebook group that I’m a member of and half recommended, half volunteering to appear on the show I found myself a couple of Thursday ago listening to the guests prior to me trying to keep my throat lubricated with the judicious application of tea. Now I’m not frightened of speaking in public, I fall over my words sometimes, but it doesn’t put me off, yet being a guest on a radio show, i suddenly had a pang of nervousness, would I dry up? would I ramble on incoherently? time to get another cuppa before i go live. Thankfully the shows hosts, Ian Gentles and Joy McCarthy were on hand to keep me in check. The show is broadcast with about a 30 second delay, so I was able to chat with Ian and Joy briefly before going live. The 15/20 minutes I was on the show flew by, with Joy asking some questions about Red Ghost Creative, graphic design, branding, being creative and finally revealing that I’m 40 next year. Thank you to both Ian and Joy for the experience of talk radio, I’ll know what to expect the next time I’m asked if I want to be on radio. If you want to hear my radio ramblings then visit the ‘Knowing your Business’ website via this link. Finally after looking back at our old site, we decided to kick ourselves into gear for 2013, the new site has many more features and will allow us to keep up to date with all the projects we’ve been working one. There are only a few projects in the portfolio at the moment, but we’ll be adding to that over the next few days to fill in some of the blanks. We are currently moving some domains around, so please be be patient if we have any downtime with out email, we’re working to keep any disruption to a minimal.